Blockbuster, the DVD and games rental chain that went into administration in January, is to close down completely after failing to attract a buyer. Administrators Moorfields Corporate Recovery said all the remaining 91 UK stores, employing 808 people, would have to close. Blockbuster went into administration for a second time in October and has been closing outlets ever since. All stores will have ceased operations by 16 December, Moorfields said. All remaining stock will be sold by Sunday 15 December, with up to 90% discount. "It is with regret that we have to make today's announcement, we appreciate this is a difficult time for all concerned and would like to thank staff for their professionalism and support over the past month," said joint administrators Simon Thomas and Nick O'Reilly. "Unfortunately, we were unable to secure a buyer for the group as a going concern and as a result had to take the regrettable action to close the remaining stores." Mr O'Reilly told BBC Radio 5 live that the timing of Blockbuster's closure, shortly before Christmas, was "purely coincidental". He added: "We really did try our best to find a buyer, but that, unfortunately, hasn't proved possible." The rapid rise of online film streaming offered by the likes of Lovefilm and Netflix made Blockbuster's video and DVD business model practically obsolete. The most recent closures follow on from previous closure announcements in November. 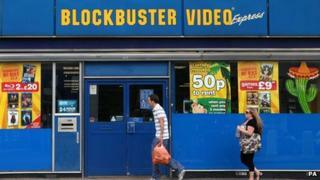 Blockbuster, the trading name of TS Operations, is currently owned by private equity firm Gordon Brothers Europe. Moorfields said high business rates had contributed to the video company's demise. Before its troubles began, Blockbuster had 528 stores.